They say good tasting food takes time to make. 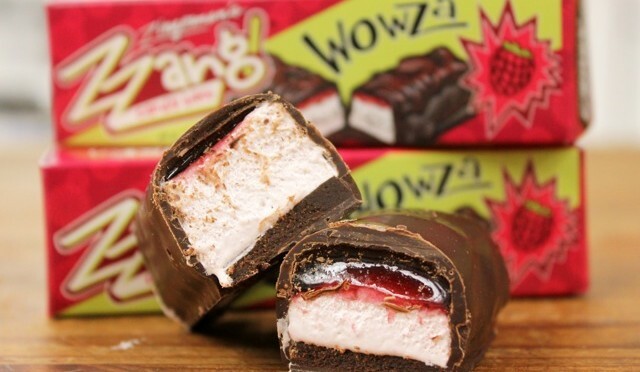 Well, the Wowza™ bar has been in the making for 5 years, and we hope all the time and care we put into it will make you say…”Wowza!” We start with a layer of rich raspberry chocolate ganache. Next comes smooth, fresh raspberry nougat dotted with raspberry jellied candies. Finally, it’s all wrapped with dark crisp chocolate. Fresh, sweet, tart, YUM! INGREDIENTS: Ingredients: dark chocolate (cocoa beans, sugar, cocoa butter, soy lecithin, natural vanilla extract), sugar, raspberry preserves (seedless red raspberries, sugar, fruit pectin, citric acid), corn syrup, egg whites (egg whites, guar gum), cream (milk), pectin, lemon juice, sea salt, granulated salt.